The “B” series: Workbooks for creating personal speech - Psycholinguistic Technologies, Inc. These two workbooks are for creating speech on personal topics. 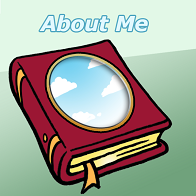 Each workbook page focusses on one topic, and the topics in both workbooks are the same: About Me, Movies and TV, My Family, What if?, My Lists, How to…, I Dislike…, My Beliefs, Holidays and Special Occasions, Music, Pro and Con, A Typical Day, I like…, and Aphasia. In the “B2” workbook, the Vocabulary Cue Buttons on the left side of the screen play prompts designed to suggest things to talk about (“Describe a person you love, or even an animal”, “Describe something that you like to do”). In both workbooks, the Vocabulary Cue Buttons on the right side of the screen play some very general verbs, prepositions, and pronouns. The WordFinder is available for additional support.